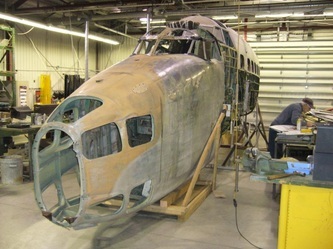 The National Air Force Museum of Canada (NAFMC), in association with the Atlantic Canada Aviation Museum (ACAM) in Halifax, and with the assistance and generosity of the Reynolds Museum Ltd., is currently restoring a 1942 Mark VI Lockheed Hudson, Serial Number FK466. The NAFMC started work on this demanding project in October 2010. 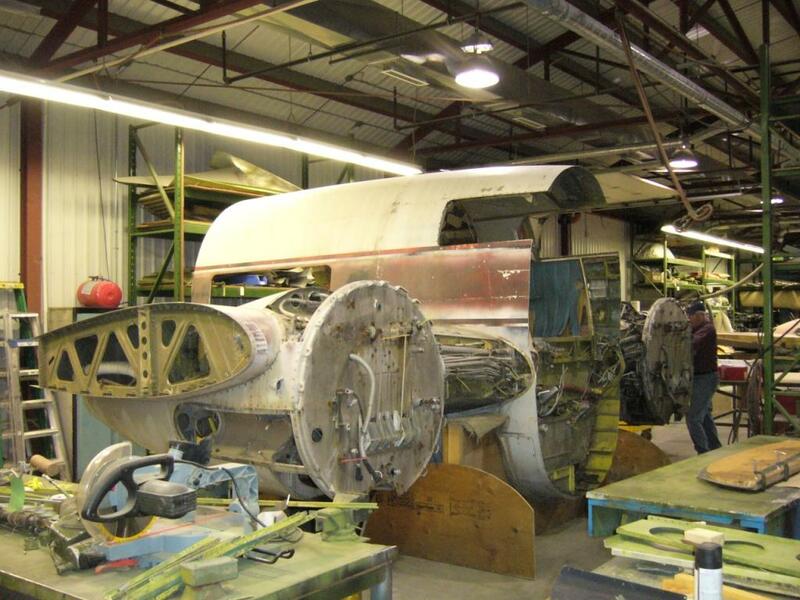 When restored, FK466 will represent a significant aircraft in the history of Canada’s Air Force and it will be the only Mark VI Hudson on display in the world. FK466 is not a complete aircraft, as it was cut up upon disposal from “War Assets” after WWII, and it requires numerous items including interior furnishings, cockpit instruments and engines. In addition, finding manufacturer’s drawings / blueprints is another priority for the Restoration Workshop team. Restoration time for FK466 is estimated at five to ten years to complete. The Lockheed Hudson was an American-built light bomber and coastal reconnaissance aircraft built initially for the Royal Air Force (RAF) shortly before the outbreak of the Second World War and primarily operated by the RAF thereafter. The Hudson served throughout the war, mainly with Coastal Command, but also in transport and training roles, as well as delivering agents into occupied France. They were also used extensively with the Royal Canadian Air Force's (RCAF) anti-submarine squadrons. In late 1937 Lockheed sent a cutaway drawing of the Model 14 Super Electra to various publications showing the new aircraft as a civilian aircraft and converted to a light bomber. 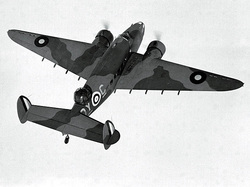 This attracted the interest of various air forces and in 1938; the British Purchasing Commission sought an American maritime patrol aircraft for the United Kingdom to support the Avro Anson. On 10 December 1938, Lockheed demonstrated a modified version of the Lockheed Model 14 Super Electra commercial airliner, which swiftly went into production as the Hudson Mk I. By February 1939, RAF Hudsons began to be delivered, initially equipping No. 224 Squadron RAF at RAF Leuchars, Scotland in May 1939. By the start of the war in September, 78 Hudsons were in service. Due to the United States then-neutrality, early series aircraft were flown to the Canadian border, landed, and then towed on their wheels over the border into Canada by tractors or horse drawn teams, before then being flown to RCAF airfields where they were then dismantled and "cocooned" for transport as deck cargo, by ship to Liverpool. Although later outclassed by larger bombers, such as the Halifax and the Lancaster, the Hudson achieved some significant feats during the first half of the war. On 8 October 1939, over Jutland, a Hudson became the first RAF aircraft to shoot down a German aircraft. They also operated as fighters during the Battle of Dunkirk. A Hudson of RCAF Bomber Reconnaissance Squadron 113 became the first aircraft of the RCAF's Eastern Air Command to sink a submarine, when Hudson 625 sank U-754 on 31 July 1942. In all, a total of 2,584 Hudsons were built. They began to be withdrawn from front line service in 1944. Some Hudsons were converted to civil transports after the war, and the Hudson formed the basis for development of the Lockheed Ventura. The only currently active RCAF Squadrons to fly the Hudson during WWII are 407 Squadron, now based in Comox B.C. ; and 412 Squadron, now based in Ottawa. It is a Lockheed Hudson Mk. VI , with Royal Air Force (RAF) Serial Number FK466, Lockheed Construction Number 414-6942, United States Army Air Force (USAAF) Serial Number 42-47022, and it was built at Burbank, California, in September 1942. It was a Lend-Lease aircraft, with Lend-Lease Requisition Number 7201 and Lend-Lease Contract Number DA-908. It was part of one of the last batches of Lend-Lease Hudsons. The Mk. VI was equivalent to the USAAF Model A-28A. The A-28A was a contract designation given to 450 Lockheed Hudson twin-engine attack aircraft intended for delivery to British Commonwealth countries under Lend-Lease agreements. The A-28A (Mk. 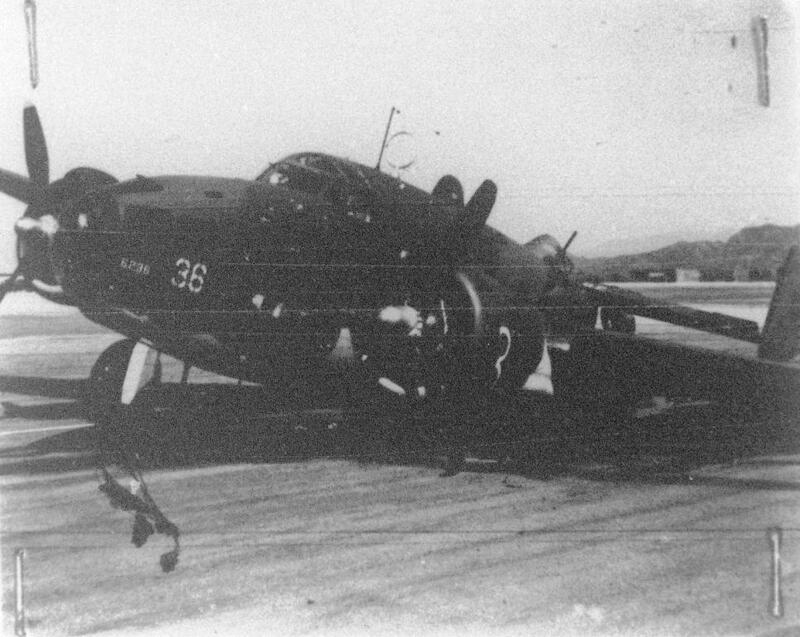 VI) was essentially an improved version of the earlier A-28. One significant difference between the A-28 and A-28A was the upgrade to the Pratt & Whitney 1830-69 radial engine, a more powerful version with 1,200 hp each at maximum takeoff power. Most A-28As were sent to Great Britain and served in the RAF in various missions. Some also served with the Royal Canadian Air Force (RCAF) and Royal New Zealand Air Force (RNZAF). A few aircraft were retained by the USAAF for use as staff transports. FK466 was ferried from Burbank, California, to Eastern Air Command at RCAF Station Debert, Nova Scotia, on 05 October, 1942 under Transfer Order No. 3263 (30 October 1942). It was first assigned to No. 31 (RAF) Operational Training Unit (OTU) at RCAF Station Debert, a formation of the BCATP. While at No. 31 (RAF) OTU, FK466 was used to train crews to ferry Hudsons to England and for the Maritime Patrol role. On 22 May, 1944, FK466 was placed on “Stored Reserve” with Eastern Air Command. On 08 August, 1944, FK466 was then transferred from the BCATP to the War Materials Office as “War Reserve”, at No. 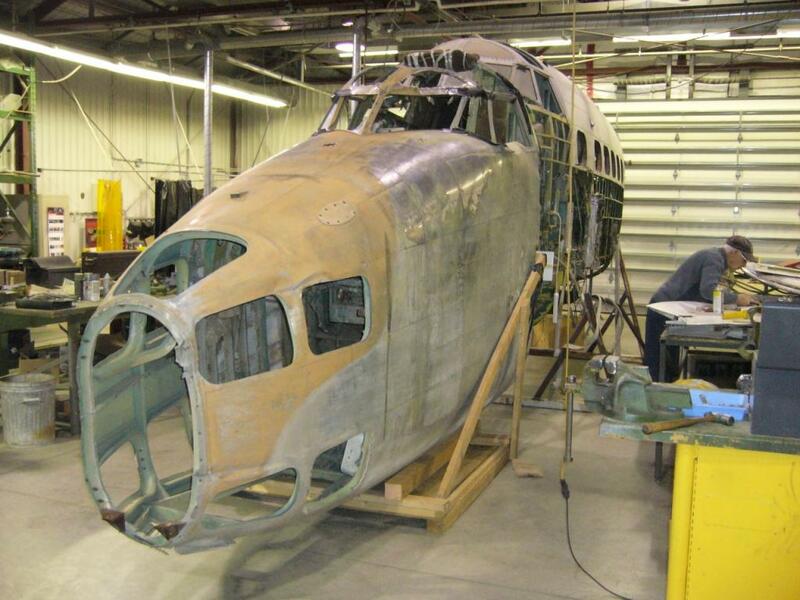 21 Repair Depot, Moncton, New Brunswick, and pending modification to Air Sea Rescue (ASR) configuration. As part of the ASR conversion, FK466 was equipped with an Uffa Fox, Mk. I, Airborne Lifeboat. These boats, which were mounted under the aircraft’s fuselage, were equipped with two gas engines, one sail and emergency rations. FK466 was then transferred back to Eastern Air Command on 12 December, 1944, after conversion to the ASR role. FK466 was now attached to No. 1 (Composite) Detachment, which was later re-designated No. 1 (Composite) Squadron on 01 April 1945, and was based at RCAF Station Torbay, Newfoundland. No. 1 Composite Detachment and later No.1 Composite Squadron had been formed to provide target towing, search and rescue, and communications duties as part of Eastern Air Command. No. 1 Composite Squadron’s diary indicates that on 17 April 1945, Flying Officer (F/O) McKay dropped a dummy lifeboat from FK466 over Quidi Vidi Lake, near St. John’s, Newfoundland. The Air Sea Rescue element of the squadron, which included FK466 and other aircraft and personnel, was transferred to the control of RCAF Station Torbay, when No. 1 Composite Squadron was disbanded on 7 July, 1945. The Air Sea Rescue Flight operated for about two months using Hudsons FK466 and FK495. The lifeboat system was utilized on 6 July, 1945, when an Airborne Lifeboat was dropped to the crew of a B-24D Liberator from RCAF #10 Squadron, Tail Number 595, which had ditched in the Atlantic off Newfoundland, after experiencing flight control problems. Whether FK466 or FK 495 carried out the lifeboat drop is currently unclear, but we are working on that mystery. No. 1 Reconnaissance and Navigation School was re-designated as the RCAF Air Navigation School on 16 September 1945, and the school was moved to RCAF Station Greenwood, Nova Scotia on 15 December, 1945. FK466 was utilized by “Station Flight” at RCAF Station Greenwood for general transport duties until 9 September, 1947, when it was placed on Aircraft Pending Disposal At Location (APDAL) at RCAF Station Greenwood, and then transferred to War Assets on 10 November, 1947. 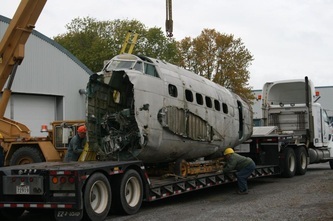 FK466 was purchased from War Assets, along with a number of B-24’s and other Hudson’s, by Mr. Pat “Airplane” Murphy, who was in the scrap metal business in Berwick, Nova Scotia. He cut off the wings in order to make transporting the aircraft easier, and then cut off the nose section to make storage easier in his scrap yard. Over the years, various parts and pieces from all of these aircraft were sold as scrap metal or for use by area locals. Mr. Laurie Layton, of L.W. Layton Salvage, in Canning, Nova Scotia purchased FK466 from Mr. Murphy in 1980 for $175. It remained at L.W. Layton Salvage as a dismantled hulk from 1980 to 1988. 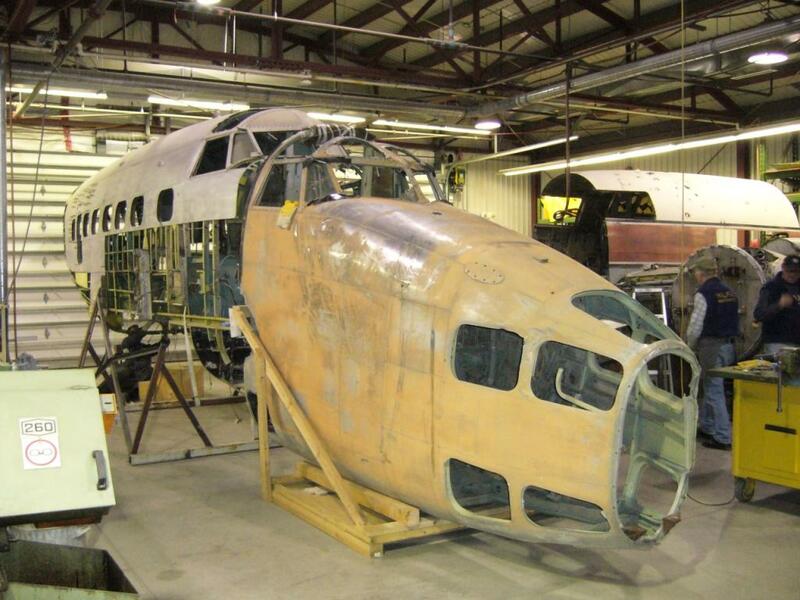 FK466 was subsequently found and acquired by ACAM members and transported to Halifax, Nova Scotia in 1988, where it has remained until October 2010, when it was moved into the restoration shop at the NAFMC. 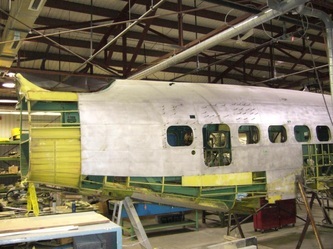 The restoration of this historic aircraft is currently proceeding with the efforts of approximately 20 volunteers who work anywhere from 1 to 5 days each week. The contribution of these dedicated volunteers in the restoration and preservation of our aircraft cannot be overstated. Our volunteers come from all walks of life and most are retired from their previous careers. We are also very fortunate to have a volunteer who was not only a Hudson pilot during the WWII, but he also flew this very aircraft! As FK466 was cut up upon disposal, the aircraft was missing a number of major structural components, namely the center wing section, the nose and cockpit sections and the tail section. Fortunately, we have been able to acquire suitable replacement structures. 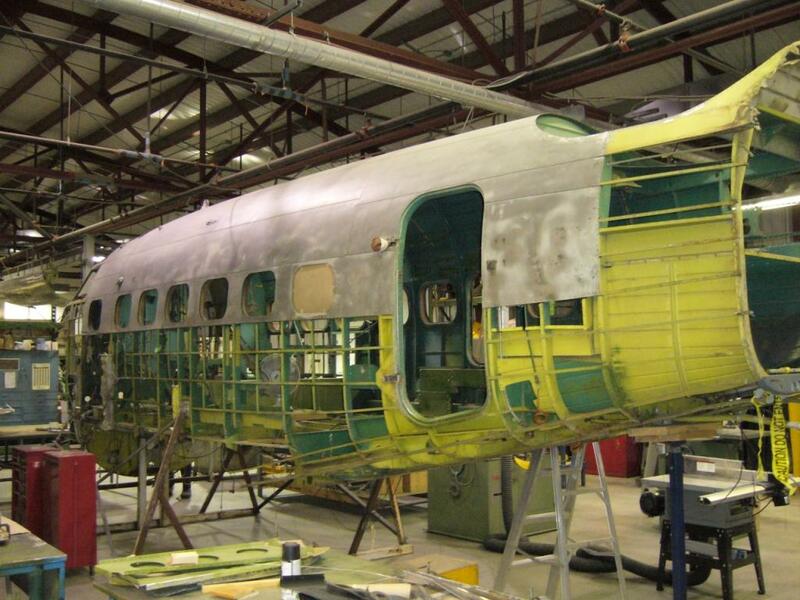 For the center wing section and the tail section we will incorporate parts from a Lockheed Lodestar, CF-CEC, from the Reynolds Museum Ltd. in Wetaskiwin, Alberta, Canada. The prototype of the Lockheed Lodestar was based on the Lockheed Model 18, which first flew in 1939. Like the Hudson, the Model 18 was also a variant of the Lockheed Model 14 Super Electra. The fuselage of the Lodestar, aft of the main-plane, was lengthened by 5 ft (1.5 m). The wing area behind the rear spar was also lengthened and the tail-plane was modified and raised for aerodynamic considerations. 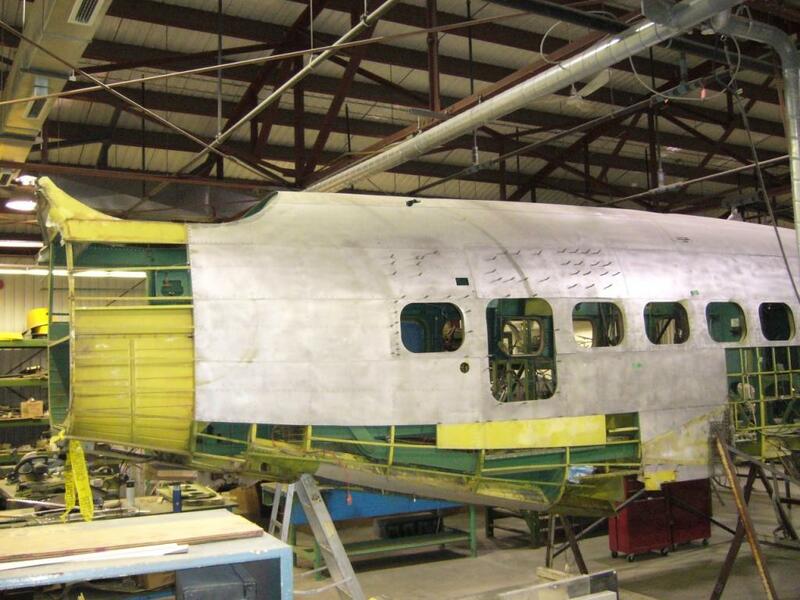 CF-CEC was dismantled and shipped to the NAFMC in October 2011, and work has already begun on salvaging the wing section. Work on the tail section and salvaging any other relevant structures will begin sometime in the near future. The C-57 was a United States Army Air Force (USAAF) designation for the Lodestar and it was powered by two 1,200hp Pratt & Whitney R-1830-53 engines. Unfortunately we do not have a complete history for this aircraft, but we are still in the process of researching. Any information on the history of this aircraft would be most appreciated. We have obtained an original Hudson nose from Aero Trader in Chino, California, USA. The nose section was shipped to the NAFMC in December 2011, and restoration and integration work will begin shortly. *Originally built as the A-29 variant of the Hudson. *Combat conversion and secondary modifications carried out at Higley Field, Arizona, USA, and was completed on 09 January 1942. *Aircraft assigned to the 4th Mapping Squadron at March Field, California. *On 29 March, 1942, at approximately 15:15 hrs local, at March Field, California, with pilot, 2nd Lt. T.C. Hitchings in command, 2nd Lt. D.D. Greer co-pilot and 2nd Lt. J.W. Scott radio operator, the aircraft ground-looped on the take-off roll and was severely damaged. -The accident investigation revealed that the tail wheel was never locked due to the lower locking pin being sheared. This may have contributed to initial directional control difficulty during the take-off roll. -The beginning of a serious ground-loop, however, occurred when the tail wheel was in the air and the aircraft had almost reached flying speed. The pilot tried to correct a veer to the left by applying right rudder. The aircraft then veered to the right of the runway and the pilot advanced the throttles in an attempt to gain flying speed. The pilot attempted to take off but, having insufficient airspeed, it landed on the left main gear, which collapsed, causing the ground loop. -The aircraft sustained serious damage to numerous components on the left hand side, including the engine and propeller, main landing gear, fuselage, tail plane, wing and the left hand forward fuel tank was ruptured. -The primary cause of the accident was assigned as pilot error, poor technique, over-controlling the aircraft. Again, any further information about the history of this aircraft is greatly appreciated. #12 Communications Squadron – Flew Hudsons in a transport role – Re-formed as 412 Squadron after the war. The history of 412 (Transport) Squadron can be traced back to the formation of two units during World War II. The 10th of September, 1939, marked the formation of # 12 Communications Flight (later #12 Communications Squadron) at R.C.A.F. Station Ottawa. 412 (Fighter) Squadron was formed at Digby England on the 30th of June, 1941. In the post war reorganization of the R.C.A.F., it was decided that 412 Squadron should not simply fade away into the history books. # 12 Communications Squadron, which had established an enviable record in the VIP air transport field, was selected to perpetuate 412 Squadron and on the first of April, 1947, it was redesignated as 412 (Composite) Squadron. Thus, the present day 412 (Transport) Squadron can trace its lineage to a World War II Spitfire squadron and its longevity to a communications flight. Our research on #12 Communications Flight shows that the Lockheed Hudson was among the various aircraft types that was flown by them during the war years. #407 Squadron – From September 1941 to January 1943, the squadron operated as a "strike" squadron attacking enemy shipping with the Lockheed Hudson. It was as a strike squadron that it won its reputation and its nickname The Demon Squadron. It may be of interest that 407 Squadron is the only remaining active RCAF squadron that flew the Hudson in an operational role during the Second World War! #412 Squadron – See #12 Communications Squadron above. Peter Hill was kind enough to send me some additional info on CF-CEC. Peter writes: "I was doing some browsing on CF-CEC this past week, and came upon your website on the rebuild of Hudson FK 466. Due to some water flooding I have been doing some cleanout and came across an article from Printed Circuit magazine, dated March 1992. 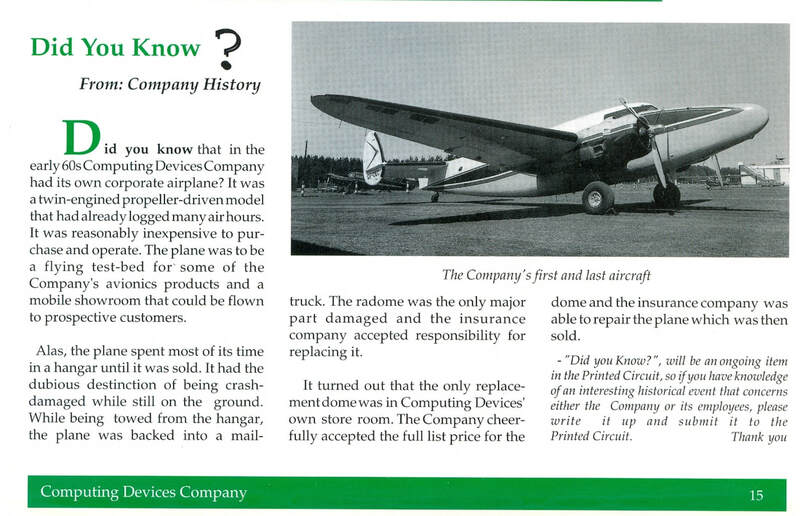 PC was the in-house newsletter of Computing Devices Canada Ltd., based in Ottawa. CDC was formed in the late 1940's, about 1947, and is now General Dynamics Mission Systems-Canada, whom I happen to work for."